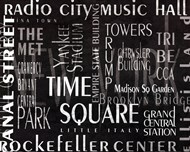 Rockefeller Center is a national history hallmark that was developed in the 1930s. The center is indeed a representation of great architecture. 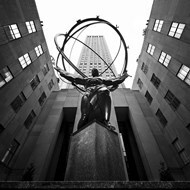 Rockefeller Center images have been used widely in different places as a way to appreciate the prowess of the designer. These images can be used as wall art as well. Rockefeller Center art pieces that we have put together in our gallery are available for you in several different colors, sizes, and image effects. You also have the images in either portrait or landscape orientation. Consider "Car on a road, Radio City Music Hall, Rockefeller Center, Manhattan, New York City, New York State, USA" by Panoramic Images, or "Atlas at Rockefeller Center" by Laura Denardo; these are images with different effects and orientation, meaning you can pick Rockefeller Center pictures of your desired orientation and effects based on what would work best for your room. Have your pictures of Rockefeller Center framed using a frame of material, color, and texture of your choice to make your room lovelier. The framing also offers you several other options that you can further choose from to ensure that the final result is one that serves your needs perfectly. 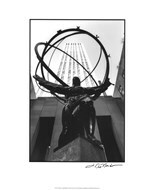 If framing isn’t appealing to you, there is the other option of printing your selection of images of Rockefeller Center on canvas. With a canvas print, your artwork magically fits in different room designs and makes it possible for you to change things in your room without worrying about changing your artwork. So, if it’s that special artwork that you would like to keep for a long term in different designs, you might want to consider canvas printing. But if all you need is some extra protection and gloss, you can simply have the artwork laminated.